The architectural imagery that you create is most effective when it examines your project in an abstract manner. Most students and practitioners understand linear perspective and cinema to be examples of architectural presentation tools. 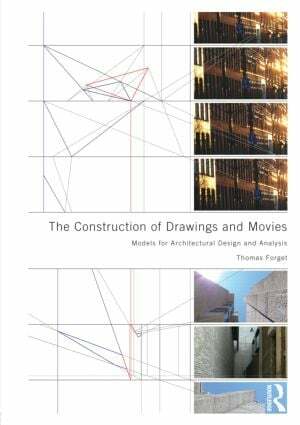 This book asks you to consider drawings and movies to be analytical tools that give you the capacity to engage all phases of the design process, from parti to presentation. The ways in which spaces relate to each other and how materials connect to each other in your projects are as important as your building’s appearance. As digital tools increasingly allow you to simulate the experience of built and unbuilt environments, it is essential that you scrutinize the nature of architectural imagery and resist the lure of virtual reality. Though pure simulation may be appropriate for your clients, your design process requires abstraction and analysis. Author Thomas Forget demonstrates how to construct analytical drawings and movies that challenge the alleged realism of linear perspective and cinema. These demonstrations expose you to underlying principles that will allow you to understand the broader implications of these methods. In addition, historical surveys of drawings and movies provide you with insight into how architects and architectural historians have understood the role of linear perspective and cinema in their fields. Finally, examples of drawing and moviemaking strategies illustrate how you can apply the lessons of the book to precedent analyses and design projects.